I had four matches, the colored lines in the picture below, for my Norwegian descended Dad on chromosome 16. However they span the centromere which is from 35335801 to 38335801, so initially these segments did not seem that promising. Nancy sent me her ancestry tree information but apologized for it not having all her data. When I get a chance, I’ll check out your family trees and see if I recognize any names or places. My ancestors mostly settled in Wisconsin, Iowa, and most recently South Dakota. I’d love to try and figure out how we are related. I replied that I needed an invite to her family tree. She sent one. I complained that too many dead ancestors were set as private. Then this fabulous news! Amazing that DNA could last this long. Aaron’s common ancestors with me are the great-grandparents of Nancy’s common ancestors. He shares only a little less DNA with us than Nancy. 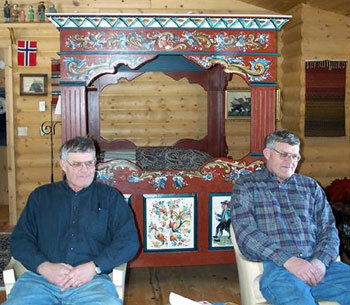 There are some interesting stories in Bygde bok about Gunnar Tollovsen & family. It says he was a very rich man and gave each of his sons a farm. Hellik got Vengestad and it says he did very well. On this farm was a big oak tree were people believed under it lived a royal family of Trolls. So the people living on Farm set out drink and food for these trolls by the tree and by so doing the Farm would have good luck. Once Hellik hired a fellow who was poor to cut the tree down but the first chop he made the ax split from one end to the other & flew back and hit him in the head, then he heard these voices say if he would spare this tree, they would bring him much good luck . [its written as a poem] The oak tree still stands today. I could scan some of these pages if you would like. Aaron has now sent along some of those pages so any family members interested to see them, let me know. So now you see what I mean by a deep triangulation. These two people are my 6th and 9th cousins. Because we found the first relationship, it narrowed down the search for the other and proved that it was the right line. We all know this, every Norwegian farm had a tree outside the house “tuntre”, and if this was cut down, you would get troubles. Everything, accidents, unhappiness etc. might come to you. And that about small trolls in the barn, was believed in all farmers. They had to give them food, to be friends and have a happy life in the farm. This happened all over in Norway. Not a story just from that farm. In tv a socalled medium told she had met those small trolls in a barn. An auther has made a lot of books of this. Very often the girls and boys in the neighbour-farms had to be married to keep the farm. A lot of people in the district are in family to each other. The ancestors reaching back to Aaron’s are not there yet, I am busy copying the information from the farm book onto GENI, then I download a gedcom and merge it to my master (FTM), synch with ancestry, upload to wikitree. It all takes time! Thought I should leave a note to say Hi! Looked around at your fan charts etc, but don’t see anything specifically matching – my Mom’s parents both came from towns south of Plzn in the Czech Republic, and all research on those lines I have so far stays in that general area. But, still have a lot of research to go, of course. Can you say more about why matching segments that span the centomere are less likely to be a match than those that don’t? I’ve been googling, but not finding anything useful. My half brother and I share match with 3 others, two of which span the centomere. There are almost no SNPs tested in the centromere since it is full of repetitive DNA stuff. Since almost nothing is tested in the centromere, segments that span the centromere are likely to be two separate segments. Also there was an article back in 2008 demonstrating that there is more recombination at the centromere than anywhere else. Are there any good step by step instructions for the GEDMATCH triangulation?..Ive downloaded to a spreadsheet but now I need to know what to do next..Thanks! Love your blog! None are specific to GEDmatch though so click on GEDmatch in the cloud for the many articles on it. What you have is a pile up. It is not triangulation unless there is a common ancestor to go with the matching segment. In the case described in the post above, when I found the common ancestor with Nancy, that helped Aaron find the further back ancestor common to all 3 of us, thus a triangulation.